Are you crunched for time? Have you started studying for your Advanced Placement® Calculus AB & BC exams yet? How will you memorize everything you need to know before the tests? Do you wish there was a fast and easy way to study for the exams AND boost your score? 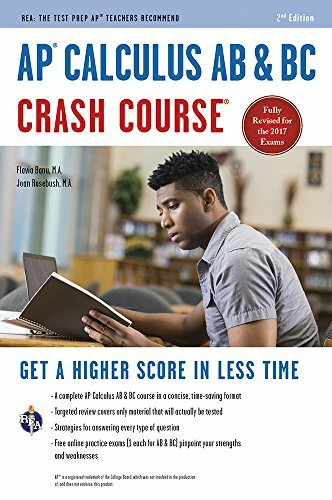 The Crash Course is based on an in-depth analysis of the AP® Calculus AB & BC course description outline and actual AP® test questions. It covers only the information tested on the exams, so you can make the most of your valuable study time. Written by an experienced AP® Calculus instructor, the targeted review chapters prepare students for the test by only focusing on the topics tested on the AP® Calculus AB & BC exams. Our easy-to-read format gives students a crash course in AP® Calculus AB & BC and covers functions, graphs, units, derivatives, integrals, and polynomial approximations and series. Our author shares detailed question-level strategies and explain the best way to answer AP® questions you’ll find on the exams. By following this expert tips and advice, you can boost your overall point score! After studying the material in the Crash Course, go to the online REA Study Center and test what you’ve learned. Our free practice exams (one online for both Calculus AB and Calculus BC) features timed testing, detailed explanations of answers, and automatic scoring analysis. Each exam is balanced to include every topic and type of question found on the actual AP® exam, so you know you’re studying the smart way. Whether you’re cramming for the test at the last minute, looking for extra review, or want to study on your own in preparation for the exams – this is the study guide every AP® Calculus AB & BC student must have. When it’s crucial crunch time and your Advanced Placement® exam is just around the corner, you need REA’s Crash Course for AP® Calculus AB & BC!